The period of Sefirat ha-Omer is one of transition, as Am Yisrael grows from one experience into another. In the spirit of the season, we are excited to announce some new steps forward that The Lehrhaus is poised to commence, as well. We have been astounded by Lehrhaus‘s staggering growth since we went live in October 2016. When we originally conceived of a forum to generate thoughtful and dynamic discourse on Jewish ideas over two years ago, we had no inkling of what reaction to expect from the community of readers and thinkers we hoped to engage. All we had as precedent were our respective experiences on social media, which indicated a very small, if still robust and edifying level of engagement. Little did we imagine the tens of thousands of hits we would receive upon our launch, and the hundreds of thousands that would follow. More important than the numbers has been the atmosphere and culture. As we explained in our introduction to the site, we hoped to draw together an eclectic group of writers and thinkers who would judge each other’s intentions charitably and engage each other’s ideas with equanimity and curiosity. We hoped to cultivate a space in which people of all sorts could engage even sensitive or controversial issues with grace and rigor, and which would be suffused by a tone at times bookish, at times whimsical, and always respectful. We have been very pleased, even humbled, by the results. But most important of all, we have aimed for Lehrhaus to be a dynamic, exciting project constantly building further momentum. To embody this, we set for ourselves the aggressive goal of publishing two brand new essays every single week, usually on Monday and Thursday. From week one, we have consistently reached and often exceeded that target. This has kept Lehrhaus fresh as our readers can consistently look forward to fresh, engaging content. Several months ago, we launched a new phase of The Lehrhaus‘s existence by completely redesigning our website, adding many new features. We have been pleased by the positive feedback. And today, on the eve of Shavuot, we are pleased to announce the next exciting phase in Lehrhaus‘s progression. With the goal of ensuring not only fresh content but a vigorous editorial energy, we are integrating new editorial perspectives, beginning a gradual shift of our editorial team that will take place over the next few months. Zev Eleff and Michael (Avi) Helfand are cycling off of our editorial team today. 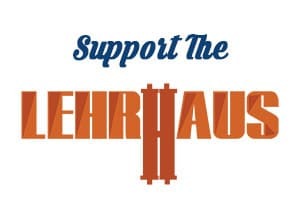 We thank them deeply for their many and sustained contributions to the Lehrhaus enterprise. Lehrhaus would not be what it is today – if it would exist at all! – absent their efforts, and we are sad to see them go. At the same time, we are very excited to bring on board four new editors who will bring their talents, energy, and ideas to The Lehrhaus enterprise. We are certain that Davida Kollmar, Tuvy Miller, Tzvi Sinensky, and Mindy Schwartz will each be invaluable additions to our editorial team. Mindy Schwartz, Editor-in-Chief of Kol Hamevaser and the Observer, incoming GPATS student. For full bios of the incoming editors, please see our Editor’s page. Thank you all for your sustained interest in Lehrhaus, and we look forward to continuing to grow in new and exciting directions while maintaining our core identity.